Scenarios are incredibly useful when performing "what-if analysis". They allow you to quickly swap a range of input values to test different possibilities without having to retype any values. Read on to find out how they work! Once you have created scenarios in a worksheet you'll want to be able to view them. This part of the series explains how to switch between different scenarios and how to modify a toolbar to create a quick way to do this. Use this dialog box to view different scenarios. The numbered steps are described below. Select the scenario you wish to view. Click the Show button to view the selected scenario. When you click the Show button the input cells will change to the values saved in the selected scenario. 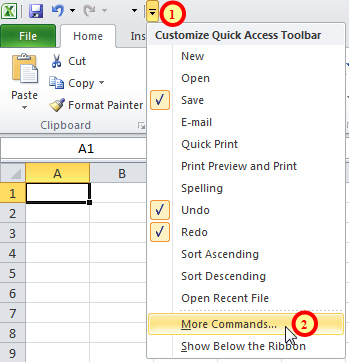 The image shown here is taken from Excel 2010, but you can do the same thing in Excel 2007. Click the More Commands... option to customise the toolbar. Follow the numbered steps as described below. Select All Commands from the drop down list. Find and select the Scenario option. Click the Add>> button to transfer the tool to the list on the right. 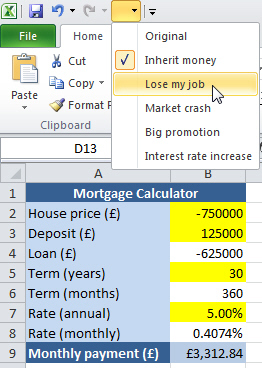 Make sure that the Scenario tool appears in the list on the right and then click OK.
Once you've added the Scenario tool to the toolbar you can use it to switch between different scenarios. 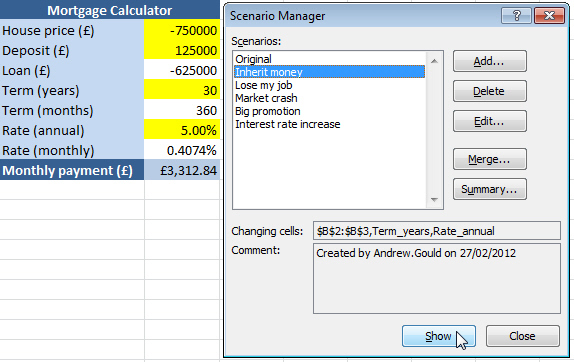 Click the Scenario tool to see a list of available scenarios and then click on the one you want to see. Select the worksheet containing your scenarios. 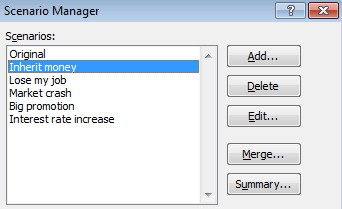 You should be looking at the now-familiar Scenario Manager dialog box. On the dialog box, click the Summary... button. Use this dialog box to set up the summary report. The numbered steps are described below. Choose which type of report you would like to create. Here we're choosing the basic type of summary report. 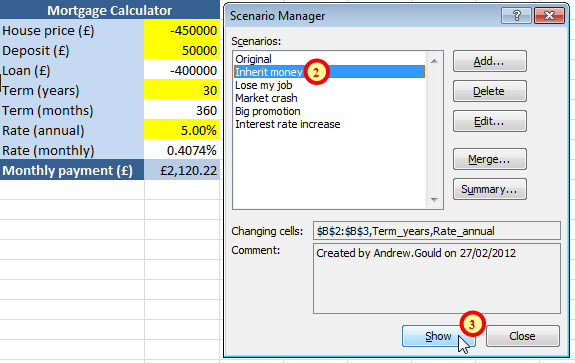 Choose the cells containing calculations whose results will change based on the values altered by the scenarios. Here we know that the Loan and Monthly payment will change as we apply different scenarios so we select these as our result cells. Click OK to view the summary report. A scenario summary report. The advantage of using range names is again quite obvious! The summary report will appear on a separate worksheet and show a side-by-side comparison of the scenarios. The values in the summary are not linked to any other values, so if you change anything on the original worksheet you'll need to run the summary report again. You can download the finished version of the file used in this article by clicking here, or see our full range of Excel training courses.